There is a popular adage often attributed to Benjamin Franklin, “Failing to plan is planning to fail.” Planning, in the sense of health and fitness, is similar to goal setting. Oftentimes when it comes to our health and fitness intentions, we start off like “gangbusters” only to fizzle out and fade away. If we have a well thought out plan to stick to with measurable targets we are far more likely to get results. This is where goal setting comes in. Goal setting can oftentimes sound complicated and difficult to monitor, but with a simple and realistic approach success is right in front of you! A method that works for me involves setting S.M.A.R.T. goals; Specific, Measurable, Achievable, Relevant, Time-Bound. So let’s state a goal in terms of health: “I will lower my total cholesterol by 20 points before Christmas Day.” This goal is specific in terms of total cholesterol lost, measurable by comparing your current cholesterol to what it will be on Christmas Day, achievable based on scientific research claiming 20% reductions through simple means, relevant as lower cholesterol will improve heart health, and time-bound because the deadline is clearly stated. 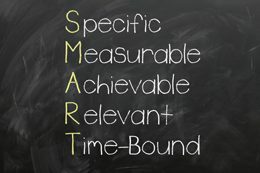 After a SMART goal is determined, objectives to help you reach your goal need to be added. I won’t go into great detail here, because an on-line search on the world-wide-web will net you endless tips for lowering cholesterol. Now, let’s go through a similar exercise for the aspiring runner: “I want to complete my first 5K run, start to finish, without stopping to walk. I have signed up for the Jingle Bell Run, which takes place on December 15, 2018.” This seems like a very specific goal, which is measurable by distance and date, achievable and relevant, and includes an event date that sets the timeline. This plan must include clearly stated objectives that will guide the individual from start to finish. A weekly training schedule that includes workouts, distances, running routes, etc. will lay the ground work for a successful fitness campaign. Remember to enjoy the journey when striving towards your goals. You will experience successes and failures that are just as important as your end goal. The many triumphs along the way will improve your overall health and wellness. Lastly, don’t be afraid of defeat! If you fall short of your end goal, it’s time to reassess and set a new target. Defeat should be a motivator to do better next time. Benjamin Franklin also said, “Well done is better than well said.” Now that you have a goal setting tool, go out and do what you say you’re going to do!